This miniature, cut from a book of Old Testament prophets made in Sicily, presents the first of the prophet Zechariah's eight visions, a subject rarely depicted in art. 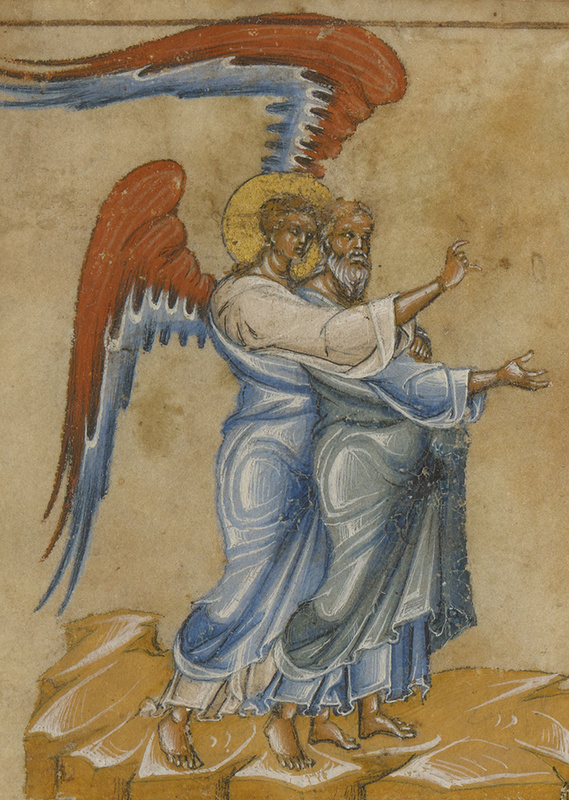 Zechariah stands on the left, next to an angel who points to a man mounting a red horse. The angel explains to Zechariah that the man and the three horses are a sign of those "whom the Lord has sent to walk through the earth." The swirling loops of folds in the figures' clothing, the white highlights used to model the forms, and the sketchy, delicate lines of the horses' manes all betray the artist's contemporary Byzantine roots. The figures' diminutive heads, hands, and feet, features characteristic of late Byzantine art, emphasize their generously draped bulkiness.